Lydia, a ten-year-old orphan, does not have a nice home. She lives with her two aunts, who are always complaining. In all her sorrows, a letter that her father has written to her before his death is often a comfort to her. But, within a few days, many troubles come her way. Mr. Russell has come to fetch Lydia to work in his circus, her aunt sends her to an orphanage because she is unwilling to go along with Mr. Russell, and Lydia is forced to go on a very scary journey through a large, unfamiliar city. However, her childlike trust in the Lord, who is a Father to the fatherless, is not put to shame. Nellie and Robby board the bus, take another look at Lydia and wave. Lydia still waits until the bus is leaving, wave once again, and leisurely walks down the busy street with shops on either side. She is not in a hurry, since she only lives a five minute walk from the school, and so it will not take her long to get home. Nellie, her friend, has every day a twenty minute bus ride, before she is at her home. She would not mind that either, every day riding in a bus and… come home nice and late. Not only that, Nellie has a nice family. A cheerful mother, a funny father, who, if he needs to be, can be very strict, but you can laugh with him as well, since he likes to tease. And of course there is Robby, a naughty boy of seven years. Last, but not least, there is Els, the baby of the family. Yes, if she only would have come from such a nice family, then it would be no problem to live close to school. Then she would make sure that she would hurry home, not being able to wait to see that little sister again and then tell Mother everything that happened today at school. But now! Leaving the busy street with all the big and smaller shops on either side, she comes to a not so busy road, at the end she has to turn left into her street that is where Lydia lives. It is a narrow and quiet street, with on both sides the same old style houses. Most of the people living in her street are old. Lydia always becomes a little sad when she comes into her street. No, you can’t find any cheerful things around here, not even on a nice sunshiny summer day. She does not understand that there are still people who want to live in a street like that. But yes… she is not in charge. And more than likely, she will have to remain living in this street. Almost at the end of the street, at number 48, she stands still and pushes the doorbell. Lydia enters into a dark and narrow hallway. That is where she hangs up her coat and removes her shoes. Once inside, she finds things as usual. Aunt Kate, who opened the front door, is busy in the kitchen, and Aunt Trudy is sitting next to the potbelly stove, nodding off with the knitting needles on her lap. She only looks up for a moment when Lydia enters the room, she mumbles, “Well…” and dozes off again. Lydia sits down at the table, placed in front of the window, and stares outside. There is nothing more to be seen than a little stone patio, a high, tall wooden fence, and the houses of the neighbors from the next street. Everything is dull, everything is monotonous. Lydia sighs deeply. Oh, you are hardly allowed to move yourselves here. No matter what you do, it makes the aunts nervous! Wait! She might as well learn her history lesson. That is due tomorrow. At least she has something to do. Lydia lies on bed, but she has problems falling asleep. She is still wide awake. The moon cast its light through the small attic window. Lydia slides a little farther down under the blankets and tightly squeezes her eyes shut. Now she really wants to go to sleep! You know what? She will count to an hundred. She has heard once that, you automatically fall asleep. She has not even reached counting to twenty that she already stops. Are you silly, it does not help anyway. No, she can better turn to her other side, she will probably fall asleep real soon. But that does not help either. She remains wide awake. She wonders why that might be. Otherwise she is asleep in no time at all. How come? Lydia thinks she knows why. To the little voice inside that is telling her, that says, “It is because you have not prayed,” she will not listen. She went to bed angry. Angry at everything and everyone. And then she decided not to pray any longer. It will no longer help anyway. She has asked already so many times if the Lord would change both of the aunts. Isn’t the Lord able to do everything? But ah, it has never helped. Both aunts remain the same. Or rather, it seems that things are getting worse. Just look at tonight, during supper time Lydia had just calmly told them that tomorrow afternoon she would be home a little later, because the teacher wanted to teach them something for the Christmas program that was to be held at the school the Friday afternoon before the Christmas vacation. But while she was yet speaking, she was sorry that she had said anything to begin with. Because, boy oh boy, Aunt Kate became fiery red in her face and her voice snapped, “Christmas program? Christmas program! Why don’t you stop, with all of your strange antics. You are only going to school because you must, but they are casting a spell on you. It is all a mere puppet show. And you believe and buy all that nonsense. I am going to pull you out of that Christian school, and you will go to the public school. Even if it means you will have to travel with the bus. You already cost me a lot of money. We might as well add this to it. Foolish child!” And so it went on. Lydia is still getting the shivers from it, when she thinks back to having to listen to all those sharp and nasty comments she heard throughout the conversation. And Aunt Trudy, as usual, never said a word, except nod her head in agreement with Aunt Kate. Lydia never said another word in defense. After supper she right away was sent to her room upstairs. And where as at other times she would be sad, when her aunt would rave like that, this time she was angry. The expectation for a nice afternoon at the Christmas program had vanished. Aunt Kate would probably make short work of her leaving that school. Leaving the school where every morning the Bible stories are read, Leaving her only friend, Nellie. That school, which now is the only nice thing she has, will all end. Then she will have nothing nice left to her at all. She will have to go to a strange school, strange children. She will never hear those Bible stories ever again. No longer will she have a teacher who prays and give thanks. Everything will be different. That… that she does not want! Not want? What do ten year old girls want? She really has nothing to say in all this. Nothing at all. The aunts are the boss. Final! That is why Lydia was angry. That is why she decided not to ever pray again. Maybe Aunt Kate is right after all, and not everything is true what is written in the Bible. And yet… she always enjoys it so much when stories are told about the Lord Jesus. And how many times has it not been that she has read Father’s letter. The long letter, which he wrote to his little Lydia, when he was so sick, and that he knew that he was going to die shortly. Mama had died already. Lydia was then just a little baby. 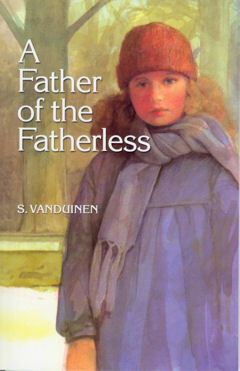 A sweet, cheerful little girl, who did not realize that she soon would no longer have a father, or a mother, and that she soon would become an orphan. How little did she know of her father and her mother. The aunts never did talk about them. She only knew this, that both her father and mother were famous artists in the circus world, and that at one time a very bad accident happened. What exactly happened, she does not know. Well… she would want to miss it for a thousand guilders. She does not understand everything, and she has no one to tell her what her father really meant. But he writes much about the Lord Jesus. And that makes her so happy. Now that she is angry, she also has to think about that letter, but she really does not want that either! Because… what good will it do her? Even that letter will not help her, she thinks angrily. How nice it would have been, had both of them lived. Then everything would have been so different. Then… yes, how would it have been? Father wrote that it all had to been this way. Because, they did not believe in God, while they were working at the circus. And he warns her, that when she becomes older, never to go to the circus, where the Name of the Lord is being mocked, and where He is not feared. Without noticing, Lydia has to think again about that letter. Quickly she crawls back under the blankets. She suddenly feels no longer angry. But she does feel sad. And so lonely. She presses her face farther into the pillow and softly continues to cry. The moon is shining its light on a small sad little girl. But… the moon can not help and comfort. But higher, much higher than the moon, the Lord lives, He hears the prayers of sad little children. And… He is able to help!